VideoPoker.com has been an industry leader for video poker fans and experts for years and continues to expand and improve to this day. VideoPoker.com offers some great free tools including flash video poker games, a video poker forum, and video poker quizzes to test your knowledge. The most unique feature at VideoPoker.com is their vast selection of free video poker games. Most sites only have one or two games at most, but VideoPoker.com has over 60 different games, and all but two of them are available for free. The other two (Dream Card Poker and Ultimate Four of a Kind Bonus Poker) require a Gold membership, which is $5.95/month or $60/year. One improvement that VideoPoker.com could make would be to allow players to edit the pay tables, so they could practice for low pay games as well. Overall though, the free games at VideoPoker.com are outstanding, and perfect for a player trying to improve their game without risking real money wagers. The next free feature that VideoPoker.com offers is video poker quizzes to test your skills and correct your leaks. Quizzes are offered for Jacks or Better, Double Double Bonus, and Deuces Wild. Each time you take a quiz you receive ten hands, and decide which cards to hold for each hand. VideoPoker.com also plays host to one of the most active video poker forums on the Internet. There are 20,000+ members and 20,000+ posts at the forum, and there are dozens of new posts every day. The level of discussion is pretty in depth, so you might want to learn a little bit about the game before you try to dive into a thread. 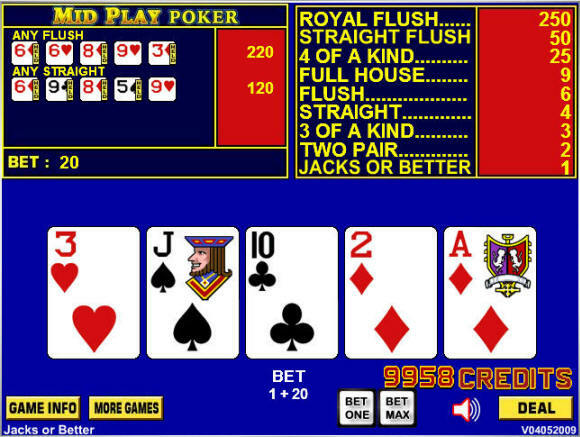 Overall, VideoPoker.com is one of my favorite video poker sites on the Internet. Although I'm not a Gold member, I still get a ton of value out of the site from the free practice games, the quizzes, and the discussions in the forum. I highly recommend you check out VideoPoker.com to improve your game and meet fellow fans.